The first image that springs to mind for some when you mention a freelancer is a lone ranger, using WiFi at the local Starbucks or an individual who works from home in pyjamas. Increasingly though, coworking spaces are becoming more and more popular around Australia and internationally. 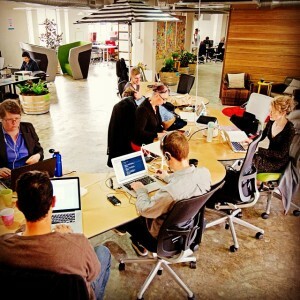 Even multinational corporations and government agencies are getting into the coworking action, to help boost their employees morale and productivity by being in an engaging and cooperative work environment. The beautiful Hub Sydney space. One notable coworking space is Hub Australia, which has shared spaces in the Melbourne, Sydney and Adelaide CBDs. These work spaces offer all the resources of a traditional office – think printers, internet, meeting spaces. However, it is interesting to note that one of the key features that draw professionals to coworking aren’t these physical aspects, but rather the opportunity to network and collaborate with others they wouldn’t normally come in contact with. Brad is also Founder & CEO of Third Spaces Group, and together with Gordon Noble and Richard Hames (President of the Asian Foresight Institute) they will be launching ‘Breaking the Productivity Impasse’. The report focuses on how a national network of work hubs have the capacity to reduce city congestion, increase workforce participation, improve work-life balance and boost business productivity. Third Spaces are launching the report in Melbourne this Monday October 28. RSVP or register for a copy of the report here.